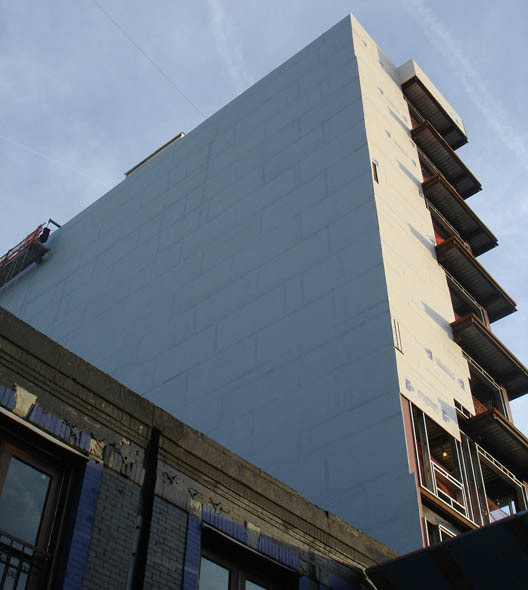 The Gowanus Lounge: Monolith of Fourth Avenue Mystery: Will It Have Windows? 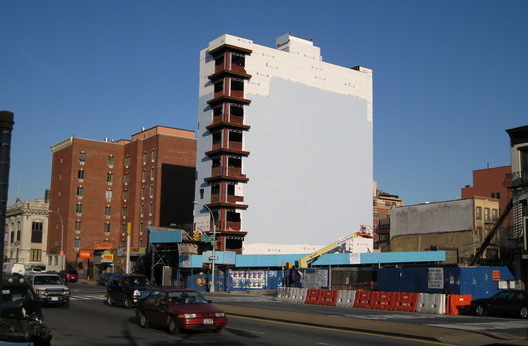 Monolith of Fourth Avenue Mystery: Will It Have Windows? It's curious because they appear to have forgotten the windows. The walls don't abut other buildings, so I can't for the life of me figure out why the wouldn't put windows in. To add mystery, they have just painted this building light blue, although I'm guessing the blue is a primer for something even more ugly to come. Speaking of which, the building comes from Henry Radusky and Bricolage Designs, so we're expecting a whole lot of brick on the exterior that bad boy and not necessarily looking forward to an excess of windows, although we presume a bunch of those will be cut into the walls that have already been placed. I pass this crap everyday and have the same questions. Yesterday I did notice that they are putting some kind of stucco crap on the north side. Maybe Radusky has decided to make this one even cheaper than his other crap. Queue the 2001 space odyssey music.